Bought this pen from a fellow in the shave forums. It’s a fine point nib. Material used is walnut. Writes smooth and nice. Freaking awesome! 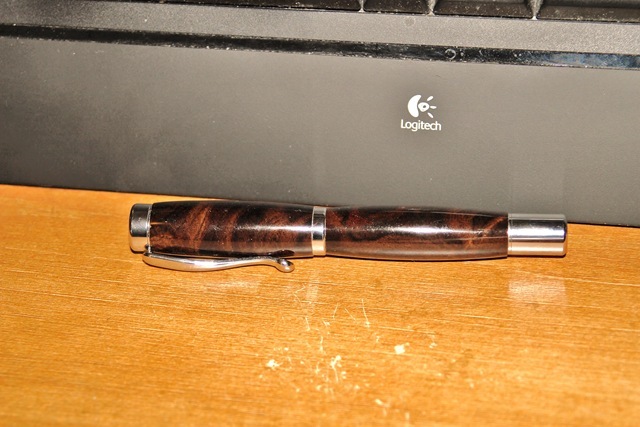 Very nice looking pen ! I only use nibs …. 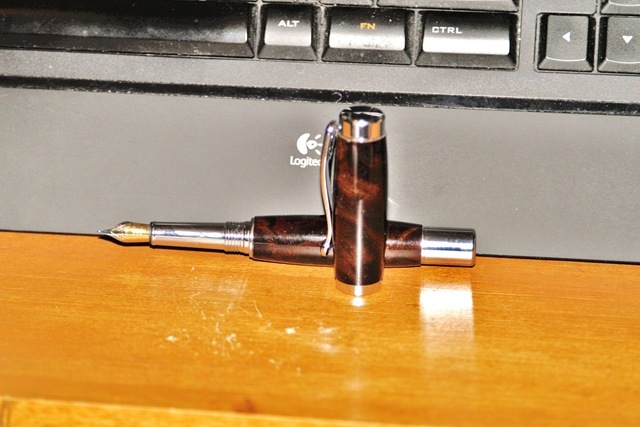 do you know who makes this pen ? it almost looks like a Monteverdi. The shaver I bought it from wasn’t sure of its maker. The only thing wrong with it is the cap won’t fit on the post. That’s no big deal, I never write with the cap posted. I have yet to find one that feels balanced when I post the cap. It is funny to me how many wet shavers have a “thing” for nib pens as well. Out of curiosity what type ink do you use ? 99% of mine are all Noodler’s inks. I have this for right now. Pelikan makes great products ! I haven’t used them, but am familiar with the brand.